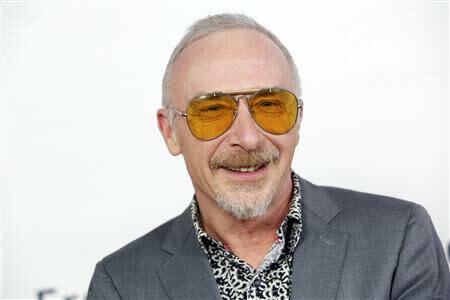 LONDON (Reuters) - Decades on from his days as an angry young rocker, a role in a Hollywood movie playing an ageing musician struggling to make a comeback has helped give a new lease of life to Graham Parker. In the movie, Judd Apatow's "This is 40", the bid fails. In the real world, however, things are going pretty well for the 62-year-old London native. He's brought out a well-received album, a documentary and a concert film with his reunited backing band, the Rumour. In late October they play their first British dates in 31 years. The London show sold out straight away. "This guy won't go away. It's like Whac-a-Mole - hit him on the head, but he keeps coming back," Parker told Reuters in an interview. "It's all come out in my favor in many ways." Parker has lived in upstate New York since 1988 and for years has played mostly solo in small venues in the United States. "It doesn't quite seem real, better things are happening than they were a few years ago. But you don't know what's around the corner and you better take it as it comes," said Parker, who sports a grey goatee and wears large red-framed spectacles. The movie "This is 40" is a comedy about a record executive going through a family crisis while his independent company is failing. The character, played by Paul Rudd, pins his hopes on reviving the career of a fading rock veteran. Apatow, a longtime Parker fan, got in touch to ask him to play the part. Not only would he, Parker replied, he would bring along the Rumour, which he had just reformed to record an album. The movie, a critical and commercial hit, saw the Rumour play live for the first time in years and a funny, scene-stealing performance from Parker appearing as himself. A DVD of the full Rumour show recorded for the movie has just been released entitled "This is Live". Parker was amazed that the London shows sold out so quickly, believing that getting the grizzled veterans back together would not be a good business move. "When people used to say 'Will you reform Graham Parker and the Rumour?' I always said the only reason to reform a band is to make lots of money and we wouldn't be making our pensions, like the Eagles or Duran Duran." "I'm doing it for all the wrong reasons, which is music, music, music. So I feel a bit righteous." Parker burst onto the London scene in the mid-1970s with a brand of hard-edged, soul-influenced music with lyrics that railed against the world. The one-time petrol pump attendant snarled out defiant songs and earned a reputation as a somewhat bitter and twisted character. "I was trying to reinvent soul music with Dylanesque lyrics," he said. Critics loved his first two albums, "Heat Treatment" and "Howling Wind", both from 1976, and his shows with the Rumour were hard-driving, impassioned events. For a while he was the next big thing. Bob Dylan was a fan and put him on the bill of his fabled Blackbushe concert in 1978. But when Punk came along, Parker was deemed unfashionable and the media spotlight turned elsewhere. "I wasn't nasty enough, I wasn't dumb enough, too old-style and too clever," he said. Still his records sold fairly well, peaking with "Squeezing Out Sparks" in 1979. "So I was having a blast, being treated like somebody, limo rides to (David) Letterman. Meanwhile in the press it was like 'we knew he was crap anyway'." Worn out by the road, the Rumour disbanded in 1982. Parker went on to work with others and put out several strong albums. But by the late 1980s, he had slipped out of the mainstream. Sipping a cup of tea during the interview - he had just got in from dates in Japan and was leaving for Ireland the next day - he looks back on his early years with self-deprecating humor and said his angry reputation was "overstated". "It wasn't really true, I got egged on," he said. In a crowd-sourced documentary that aired in March, admirer Bruce Springsteen commented that the young Parker was "caustic". "There's a hard edge to the songs that makes them a bit unpalatable," Parker conceded. "When I listen to something from 'Howling Wind', I think aw, that's nasty." On his new album, "Three Chords Good," Parker is mellower. In the song at its heart, "Long, Emotional Ride", he sings: "I never took one word of advice/Never in my whole life/But now I wanna hear what other people say." The song was a result of the response to the crowd-sourcing appeal for the documentary, he said. "I realized people have cared about me for a long time. It was very moving and humbling. They wanted the story to be told. It blew me away."